The problem with truly virtual synths? No sound. Tom also points in an update to the virtual studio featured last year on the Second Life blog SLOG. Now the bad news: a lot of this gear is entirely virtual. It’s just 3D eye candy, a la the Sims, with the disturbing requirement of having to actually pay real money for it. (Money for a non-functional 3D virtual mock-up of a virtual synth? What?) 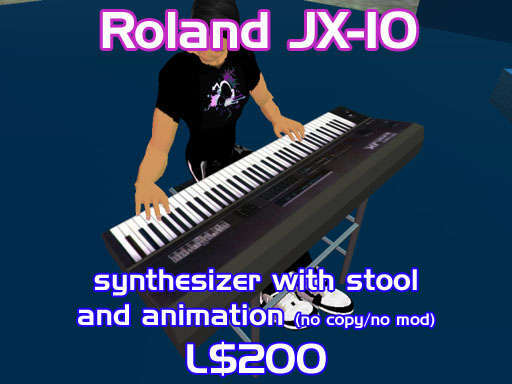 At best, you’ll get an animation of someone playing the synth. A virtual studio by Second Life user Octal Khan, as seen on SLOG. I think I’ll clean and reorganize my real studio instead. Naturally, this gets my gears turning. While SLOG can only dream of General MIDI integration (oh … boy … wouldn’t that … be fun), I’m thinking about a virtual 3D world that can transmit and receive OSC data and simple audio streams. Second Life can at least do the audio end, but 3D worlds that allow you to control real music sources while in the virtual space could add more dimension. Search CDM for Quake and Unreal and you’ll see some other examples. Second Life, as much as the kids today may love it, may not be the best environment for that. Second Life is becoming a major international community for music, and Ableton’s David Cross wondered in an email to me the other day if perhaps this would extend from communities of listeners to user groups and communities of music makers. The synths might all be eye candy, but there are free spaces with concerts and chances to experience music — a lot more interesting, as far as net music, than staring at a QuickTime stream. That’s made me wonder, for those of you who do have time for a Second Life, has anyone found interesting communities or resources in SL? Or is it really just hype, and there’s a better alternative virtual community? Let us know.